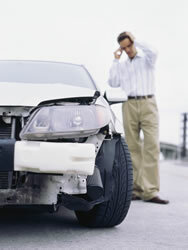 In the past few years, we've cared for many people with auto injury pain in our Arlington, WA office. Chiropractic adjustments are the optimal approach to these kinds of injuries, and some studies have shown that more than 90% of patients show improvement after a car accident when getting chiropractic care. A crash subjects you to high-speed, violent motion that it wasn't designed to handle. As a result of the dramatic forces you're subjected to the ligaments, tendons, nerves, and muscles of your body can be stretching, spraining, or tearing during a collision. This can trigger persistent pain and impairment if not dealt with promptly. Headache Pain - Nearly every auto injury patient in our clinic reports headache, and this can have a wide array of causes, based upon on the type of injury you received. Low back pain - Yet another common problem in adults before and after an accident is back pain. Neck aches and pains - Your neck is one of the most vulnerable parts of your whole body in a car accident, and it can easily be injured. The fact is, most symptoms that arise after a wreck can be directly linked to injury of the cervical spine. Your chiropractor can also help to identify more serious neck injuries like artery damage. Shoulder pain - Your shoulder can be injured by the seatbelt, the forces on your arm during a collision, or can be a secondary symptom triggered by neck injury. Jaw pain - Jaw problems (or TMJ dysfunction) are still another frequent condition we see in our Arlington, WA office, and can be difficult to diagnose. In some cases TMJ problems doesn't manifest for many weeks or months after your injury. Radicular pain - Radicular, or radiating pain can be diagnosed by numbness or prickling in your arms, hands, or legs, and many auto injury patients report this problem. Vertigo/Dizziness - This is a challenging symptom that can also have a wide array of origins. In most instances, we find that neck injury is the primary cause of the sensations of dizziness and vertigo. Thoracic Outlet Syndrome - Thoracic Outlet Syndrome is another symptom triggered by injury to your neck during a crash. If you're suffering from any of these signs or symptoms after a car accident, give our office a call. It's important for you to know that you don't have to suffer! Chiropractic care is a safe, successful, and non-invasive method that really works for these types of injuries. If you've been injured just a short time ago, it's important that you seek treatment quickly! Untreated injuries can give rise to reduced mobility and the creation of scar tissue, and that can lead to prolonged pain and impairment. Studies show that early, gentle mobilization of the damaged tissues can boost healing and prevent long-term problems. Our clinic is conveniently located in Arlington, WA, and we would love to help you get back on the road to health. Give our clinic a call now at (360) 659-8464 for an appointment.